47×33 inches. 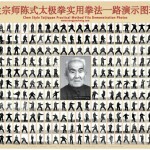 This is a wall chart of Hong Junsheng’s Yilu photos. It is not a learning chart! This product is available now. Master Chen, will these be available at the Toronto workshop this September? Thanks. Yes, a small number of copies will be available. Just received my Hong poster! really nice, thank you! I purchased one at the last Maple Ridge Workshop. Beautiful piece of Practical Method Taiji history! Very nice indeed! I bought 2, one for home and the other for the Wellness Center where I teach. I took them to be framed. An important piece of history I wish to preserve and share. 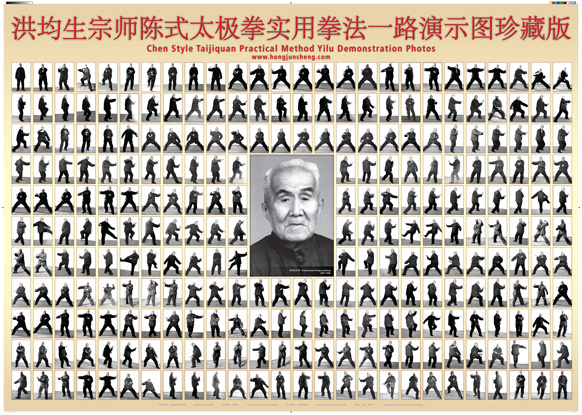 I received today the Hong Junsheng Yilu Photo Wall Chart. The clarity of the print and the quality of the paper are very high. I strongly recommend this Wall Chart to all for its historical and aesthetic values. when will more be in stock Master Chen? Let me know where you are and I will see what I can do. I am headed back to China again and I can try shipping from there. Will the Yilu Photo Wall be available again. It is a useful reference tool. Perhaps a smaller version may be in the offing? When will the wall charts be available again ?